Enjoy these chocolatey bars as a treat, while knowing that the banana, almond flour, and fiber-rich oatmeal and figs are heart-healthy ingredients. In a large bowl, combine mashed bananas with oatmeal. Finely dice figs and dates or pulse in food processor. Add figs and dates to oatmeal mixture along with almond butter and mix until well blended. Fold in remaining ingredients into mixture. Press mixture into prepared 9-inch square baking dish. Bake at 350º for 20 minutes in preheated oven. For topping, melt 1/4 cup semi-sweet or dark chocolate chips. Spread melted chocolate on top of baked oatmeal dish. Cool completely in refrigerator. 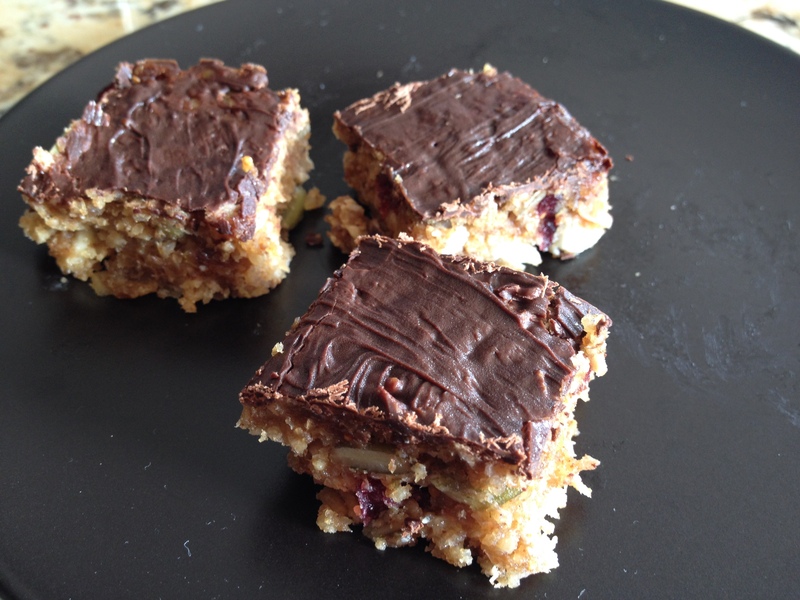 Cut into 1 inch square bars and serve.